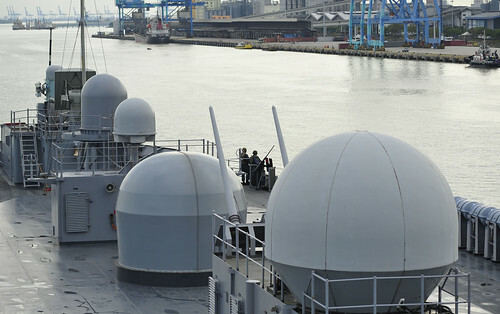 WEST PORT, Malaysia – U.S. 7th Fleet flagship USS Blue Ridge (LCC 19) arrived in West Port May 18, emphasizing the U.S. Navy's commitment to the Royal Malaysian Navy and the Asia-Pacific region. While in port, Blue Ridge crewmembers and 7th Fleet staff will host guided ship tours and conduct staff talks aboard Blue Ridge with their Malaysian Armed Forces counterparts. Crew and embarked members will have the opportunity to interact with local residents through community service projects, sporting events and to experience the country's unique culture by touring landmarks and trying new foods. "Visiting Malaysia allows Blue Ridge to give a visible display of partnership," said tactical information warfare officer Lt. Erik Knebel. "The interaction through military exercises and community engagements instills confidence in our relationship." Several Sailors and Marines will be hosted by the Kuala Lumpur American Sailors Social (KLASS), providing them with the chance to see the city in a way local American residents see it every day and as a way to thank them for their service. "I am thrilled to participate with the families from KLASS," Said Legalman 1st Class Zandee Galang. "The last time I was involved with an event like this, I was shown aspects of the city that went far beyond tourist traps. I had the opportunity to see some truly amazing things that I probably wouldn't have seen otherwise." "Our community relations with Malaysia is a small part of the message we are trying to convey," said Blue Ridge chaplain Lt. Anthony Stallings. "A lot of people see our warships and attach negative connotations to them, but our duties and responsibilities go much further than power and defense." KLASS is a community relations opportunity for Sailors to go meet and socialize with local American residents for a night on the town as a way for them to say thank you for protecting America's interests at home as well as abroad. "No matter where you are, you can always give back," said Stallings. "In this case, the local residents are giving back to us, to say thank you for all that we do." Blue Ridge has been forward-deployed to Yokosuka, Japan, for 34 years, strengthening allied ties through community service projects and conducting joint military exercises with regional nations.